I heard this from TWO sources when I started posting old articles from when the Coliseum vote was taken. 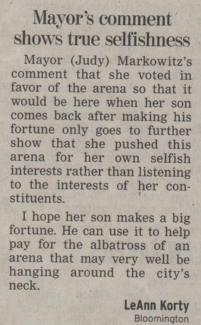 Evidently Mayor Markowitz wanted the arena built, at least in part, because her son loved hockey and she wanted him to move back to town. Anybody not see the same selfish interests still running both Towns? Posted in BloNo, Bloomington, Liberal Media, Local, Pantagraph, Progressives, Taxes.Tagged Coliseum, Judy Markowitz, Letter to the Editor. Other than government continues to lie to the people to get what THEY want. Did you read this morning’s issue of the Pantagraph? Special interest group wants City/Town to pay for soccer complex. No one is beating a dead horse. No one is beating a horse at all. If history isn’t studied, one is doomed to repeat the same mistakes. Almost done with a story now! Those that don’t learn from history are doomed to repeat it. Wonder if the Pantagraph will reprint these with a “then and now” style segment. Wishful thinking, at best.